I have found a two main things different than my HTC Arrive on Sprint. The second thing I am noticing that differs from my Arrive is group texts. When I add a group of contacts into one text message, I expect that they will send to everyone as a group chat, but right now it only sends them individually. Here is a screenshot of what I expect in the settings http://i.imgur.com/WNfaO8O.jpg , but here is what is current here for the ATIV S Neo: http://i.imgur.com/7s0VloK.jpg . Does anyone know how to fix it? I know other people that are on different carriers. How would I go about the restoring process? Just to be clear, it involved both of you factory resetting / restoring your phones, so that you can log in with your Microsoft Account on the other phone. They will have to set up their phone again afterwards, meaning they will likely lose progress in saved games, etc. If they are comfortable with that / want you to have group messages badly enough, this is what you do. 4. 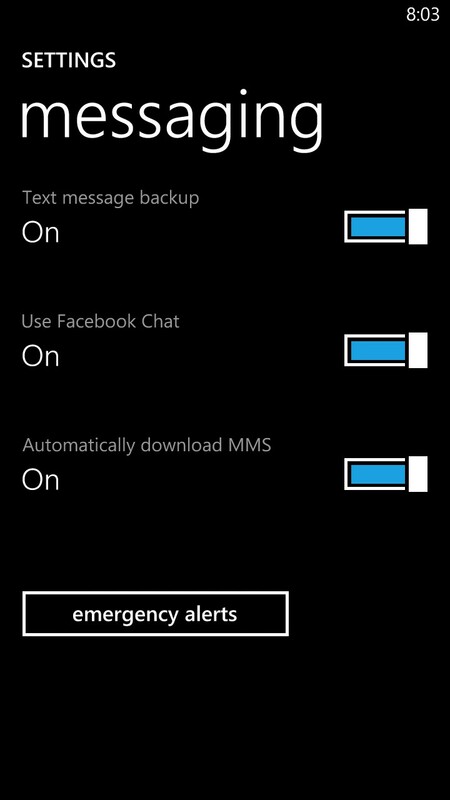 Make sure the phone is set to backup App List and Settings to the Cloud (in settings). 6. Log into your phone with your Microsoft Account, choose to restore settings from a backup, then choose the backup you made on your friends phone (Lumina 920, 928, etc). 7. Let it restore the settings and applications. 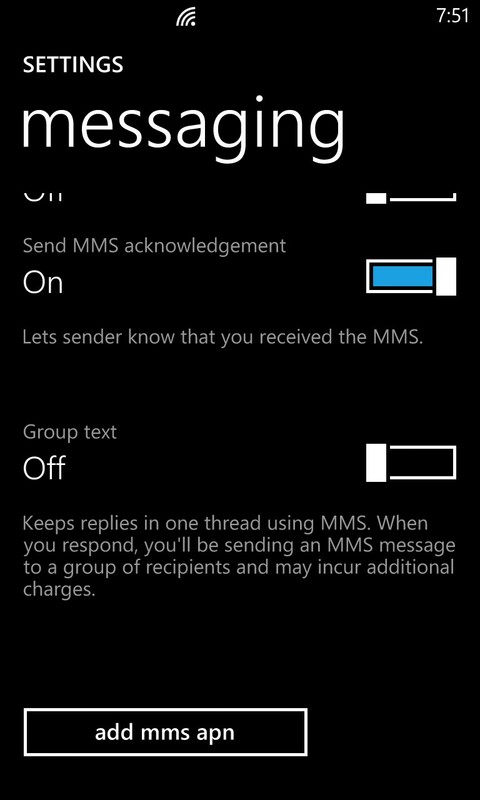 Restart the phone and try sending a group text as it should now, secretly, be enabled. 8. If it works, reset you friends phone so he/she can log back on and use it. Try again if it doesn't. That did it for us on Verizon. Good luck. I'm not a fan of group texts. I get them from iOS users all the time and it drives me batty. For group messages, I rely on Facebook messenger, which I'm missing having a dedicated app to handle. (The built in FB messaging in People doesn't support group chats). have you tried the Facebook app? Yeah and I also discovered that you can pin a shortcut to messenger to the start screen too which is great. I leave myself signed in to FB messenger via the People app, but last night I didn't receive notifications for messages sent to me. I didn't realize it at all until I looked at another device at home. This is my first WP8 device. Are missed notifications a common occurrence? There seems to be a problem with Facebook specifically, and I've read that if you uninstall the app things work. I don't use Facebook messaging, so can't really try it out but my Facebook notifications never work. No problems with any other program, just Facebook. 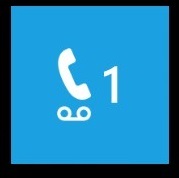 A possible work-around is this: 1) Keep visual voicemail on your phone. This may be more of a misnomer--while it is the app/hub for "Visual" (transcribed voicemail, if you don't subscribe, it ALSO appears to be the place for phone settings for your Sprint voicemail. They advised to update to the most recent version of the Sprint app, "Visual Voicemail" through the [Windows Phone] "Store" app on the phone. Hit Sprint apps and find Visual Voicemail and install/update it. 2) Next when you go into the Visual Voicemail settings (hit the ... at the bottom and then settings), at the top under "manage your subscriptions," click it and make sure you've checked Free Trial, NOT premium subscription--premium will incur a monthly $1.99 fee for transcription. After that, you should be set. Not sure if this works for just restoring normal voicemail notifications as I'm still waiting for a new message, but I hope it works. One more thing, under the rest of the settings, make sure that "Visual Voicemail" is selected under the quick application access within your phone's lockscreen settings in the phone "settings" or accessed through the Visual Voicemail Settings. Otherwise, you may have to either continue calling in randomly to see if you have new messages OR tapping the visual voicemail app to check for you while Sprint and Microsoft work to fix this. It may be that in order to try to get us to use / give us a Visual Voicemail option, they've screwed up the regular notification process. ...I'm still hoping it works for me. Good luck to all! Facebook notifications have been problematic for awhile now, it seems. paulbohnen, I have tried every possible solution and that has not worked. You will not be notified on the live tile if there is an update, you have to manually sync. Plus the performance is very poor.